Who doesn’t love any recipe that calls for cheese and bread? Life doesn’t get much better than homemade pizza rolls, y’all! 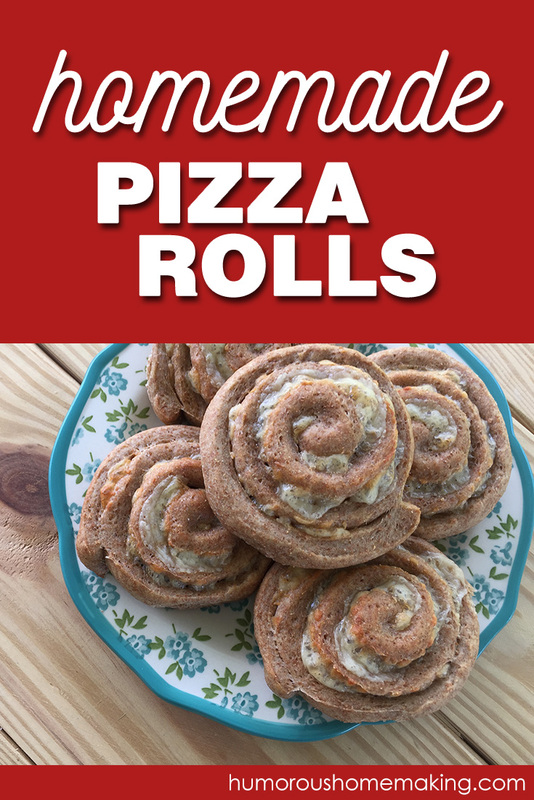 For these easy and delicious rolls, I use the Bread Becker’s basic dough recipe. You have probably learned by now that’s pretty much what I make everything out of! But when I know I’m going to make pizza or pizza rolls, I typically leave the egg out. The basic dough recipe will make 2-3 pizza crusts and 2 batches of pizza rolls. 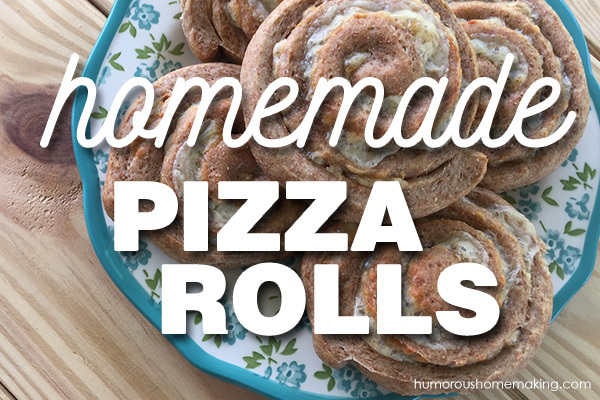 Usually, when we make these pizza rolls, we make them with pepperoni…lots and lots of turkey pepperoni. Some people say they don’t like the texture or taste of turkey pepperoni, but I really think that the rolls just cook up so much better without all that grease that regular pepperoni has. And if possible, try to find nitrate/nitrite free pepperoni. It’s hard to find near me, but I’ve been told Walmart, Target, Kroger, and Trader Joe’s (just to name a few) all carry these healthier varieties. Usually pepperoni has a long refrigerator shelf life, so you can buy in bulk when you find a good healthy option! Please don’t use pre-shredded cheese. I’m sure I sound like a broken record, but y’all… we need to make America grate again. Grate cheese. Just don’t try to use your food processor or blender to grate soft cheeses like mozzarella. This may work well for parmesan or hard cheddar, but makes mozzarella a mushy mess. How’s that for alliteration? No matter what style of pizza roll you make, don’t ruin it before you get started. M’kay? Roll out the dough into a large oval. Give the rolls plenty of room to spread out in your pan. If you don’t leave adequate space, they will spread up and not out. And nobody wants that! If you use USA Pans, you don’t have to grease your pan and nothing will stick! But if you have another kind of pan, I would recommend for you to spray or grease it. Have a little fun and change up the filling a bit! If you want to give this recipe a different kick, try cooked, crumbled sausage and mozzarella. Or how about ham and Swiss? Or you could try crumbled ground beef and cheddar cheese for a cheeseburger roll. The options are endless… And I am officially hungry. Guess I better go eat some fat bombs to tide me over! Prepare you favorite bread dough according to recipe, allowing the dough to rise for about 45 -60 minutes, until doubled in size. Dust your board or counter with flour and roll the dough out into a large oval/rectangle. Lay a layer of pepperoni (or other filling) on the dough. You want maximum coverage so it’s fine if they overlap. Sprinkle the cheese equally over the top of the filling, going all the way to the edge. 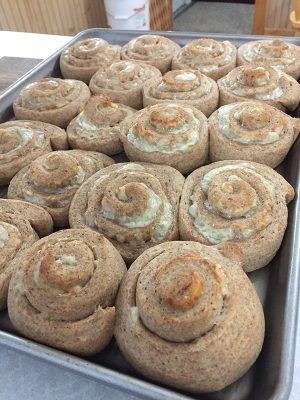 Carefully roll dough, cinnamon roll style. Using a bread knife, carefully cut the rolled up “log” into 15-18 pieces. Place the rolls carefully on a USA Bakeware 9×13 pan (or use two round pans). If you are not using USA Bakeware, you might want to grease your pan first. Cover the rolls with a towel and leave at room temperature for about 30 minutes. Bake at 350 degrees for abut 25 minutes, until they turn golden brown. Serve with warm marinara sauce or enjoy plain.